Combing Dynamic Investments into Market-Sensitive Portfolios! Holding just the Primary/Core DI in your portfolio can be a very smart investing decision. As shown on this page, it earned an average annual return of +29.6% during the volatile period from the start of 2008 to the end of August 2018 with low risk and no active management required. But many NAOI students who are currently working with NAOI-designed DIs tell us that they are not yet comfortable allocating all of their money to just one ETF at a time. And this is understandable. So they use DI as portfolio building blocks. To work within a more familiar investing environment the majority of our DIT students use single DIs as building blocks to create diverse portfolios that can hold multiple ETFs at any one time. They have a choice of two portfolio types. One consists of combining multiple DIs in what we simply call a Dynamic Portfolio. The other option is to insert one or more DIs into an MPT, asset-allocation framework that we call MPT/DIT Hybrid Portfolios. Each of these portfolio types is discussed below. Dynamic Portfolios are created by combining multiple Dynamic Investments into the portfolio framework. Each DI will contribute one ETF to the portfolio's holdings. Thus, at any one time in can hold multiple ETFs. A Dynamic Portfolio can be configured using the same Core and Explore structure used for today's MPT portfolios as illustrated below with example DIs shown. The example DIs are discussed below the chart. NAOI Primary DI - This is the "anchor" investment of virtually all Dynamic Portfolios. It simply rotates between a Stock and a Bond ETF as describe on this page. There you saw that the Primary DI earned +26.7% per year during the period from 2008-2017 with relatively low risk. Let's look at how a Dynamic Investment can be created for each market using Emerging Markets as an example. To create a Dynamic Investment for Emerging Markets we design it with the following Dynamic ETF Pool (DEP): (SPY, EDV, VWO). SPY is a Stock ETF, EDV is a Bond ETF and VWO is an Emerging Market ETF. This DI will only buy and VWO and hold it for one quarter if it is trending up more strongly than either Stocks or Bonds at a quarterly review. To review this process go to this page. We have essentially "wrapped" VWO with a Stock and a Bond selection option. By doing so we make each of the market-focused ETFs dynamic and enable them to produce returns that are higher than just holding the market ETF with less risk. Below is a performance comparison for just buying and holding VWO vs. holding a Dynamic VWO in a DI format. The test period is 2008-2017, a full 10 years. During this period the standalone VWO was simply bought and held for all 2518 days in the period. But in the dynamic investment, VWO was held just 817 days with either the Stock or the Bond ETF being held for the other days. This enables the DI with VWO in its DEP to significantly outperform the standalone VWO. All "Explore" market-focused ETFs are wrapped by a Stock and Bond ETF as just explained. All Dynamic Investments are essentially "portfolio products". This means that a Dynamic Portfolio is a Portfolio of Portfolios. This "outside-the-box" thinking opens the doors to performance that is simply not possible using today's MPT portfolio methods. MPT and DIT methods can work together! An MPT/DIT Hybrid Portfolio simply uses the MPT asset-allocation portfolio structure with one "asset" being a Dynamic Investment as illustrated in the diagram just below. You can see that a portion of the total portfolio looks exactly like a traditional MPT portfolio that most investors hold today. Another portion is a DI as discussed on this site. We also call this a "market-biased" portfolio. You can see that when stocks are moving up this portfolio will have a 75% allocation to stocks and a 25% allocation to bonds. When bonds are moving up it will hold 75% bonds and 25% stocks! This is an amazing portfolio style that produces superior returns with minimal risk. This type of portfolio can easily be created today by an advisor or an individual who has studied Dynamic Investments in The Amazing Future of Investing book. And the percentage allocation to the DI is at the designer's discretion. Many NAOI students prefer to start with this type of portfolio with perhaps a 20% allocation to the DI and then increase this allocation as they experience its superior performance. Below is a performance chart that shows in the top row the 2008-2017 performance of a generic MPT portfolio with a 50% allocation to Stocks and a 50% allocation to Bonds. This is a buy-and hold portfolio. The middle data row shows the performance of the NAOI Primary DI that rotates between a Stock ETF and a Bond ETF. and on the bottom row shows the performance of a Hybrid Portfolio with a 50% allocation the MPT portfolio and a 50% allocation to the Dynamic Investment. You can see that the Hybrid Portfolio provides significantly higher returns than the traditional MPT portfolio with significantly lower risk as indicated by the higher Sharpe Ratio. Using a Hybrid Portfolio, individuals and/or portfolio designers can control the rate of transition from the current, static, MPT-based investing world to the dynamic investing world of the future. This can be done by simply increasing the allocation of portfolio money to the Dynamic Investment. The transition can be made as slow or as fast as desired. The following table shows one transition strategy that progressively increases the allocation to the DI portfolio component (shaded in green) while decreasing the allocation to the two elements of the MPT Portfolio (shaded in red). The data illustrates why portfolio designers should seriously consider making the transition to DIT sooner rather than later. MPT-only portfolios simply leave too much money on the table. The NAOI provides the knowledge needed to design and use Dynamic Investments. But this is not sufficient. It is also important to understand how to use DIs in a manner that ensures their staying power. Therefore we also offer strategies for using DIs in a variety of ways that does not disrupt current operations and revenue streams. 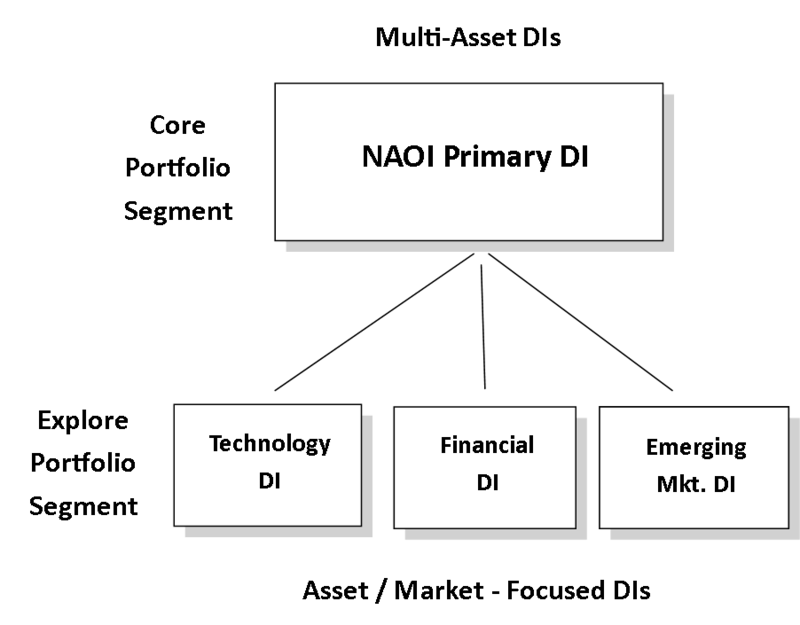 Thus, the NAOI has a complete DI support division that works with organizations to integrate DIs in a manner that meets their unique needs and goals. We do this through our Consulting Services as discussed in more detail on this page. And, of course, Dynamic and Hybrid Portfolios are discussed in greater detail in The Amazing Future of Investing book that can be purchased in the NAOI Store.